The Dr. Dabber Ghost kit gives you everything you need to vape concentrates, all in one convenient little pen. With the kit, you get a USB Charger, silicone storage ball, loading tool and extra titanium atomizer, as well as the unit itself, which consist of the atomizer, the mouthpiece, and the battery. Let’s get into how it works. If you’re just looking for the best place to buy the Dr. Dabber Ghost, Click Here to be taken to Vapor Nation, which is the best deal online. Like most concentrate pens, the Dr. Dabber is really simple to use. all you have to do to turn it on is press the button on the battery quickly 5 times. This will unlock the battery and make the unit ready to use. To load the unit, all you have to do is take a dab of your concentrate with the included tool and gently place it on the coil. It’s important not to press the coil too hard, as this could damage it, rendering the atomizer useless. Luckily, if anything does happen to the atomizer, you have an extra one to replace it. The atomizer (pictured below) of the Dr. Dabber is the most unique feature of the pen by far. The recessed shape is unlike most other atomizers, and this innovation makes it easier for your concentrate to flow down to the coil. This wastes less, and makes cleaning easier. The coil is also made of titanium, allowing for better flavor than other pens. The battery lasts decently long in this unit, and if it doesn’t last long enough, you can still use the atomizer on a battery with a higher capacity. The battery the kit comes with is perfectly adequate though, and it doesn’t take very long to charge either (roughly 1 and 1/2 hours). The vapor is more flavorful than almost any pen I’ve tried, and I believe this is due to the lower temperature that the titanium coil provides. The vapor is only slightly warm when it enters your mouth, and has none of the burnt taste you can get from some pens. 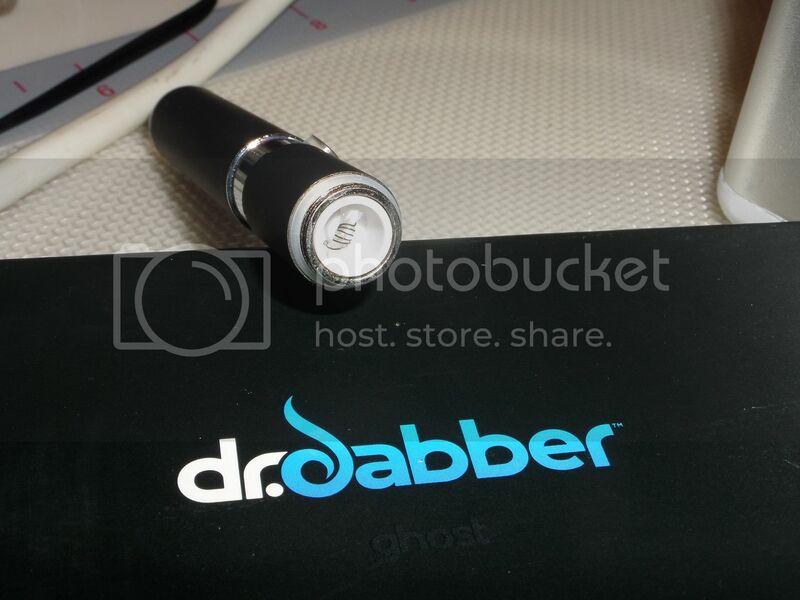 Where to Buy the Dr. Dabber Ghost? We’d recommend grabbing this pen from VaporNation.com. If you’ve been following our blog for any amount of time, you know that they are one of our favorite companies, and for good reason. They have the lowest prices (and will even price match), ship the items to you for free, give you free bonuses with your order, and are always running promos so you can save some cash. Overall, this is a great kit for the money. At only $84.95 for everything you need, the Dr. Dabber is a fantastic vape pen. Plus, you can reuse atomizers after they get too dirty by soaking them in rubbing alcohol, giving this pen a long life (and saving you money). If you want a kit that gives you everything you’ll need, and all for under $100, this pen is an amazing choice. Sorry to hear about that Tim. I’m sure you already thought of this, but is there no way that EveryoneDoesIt could get a replacement shipped to you that is already in the UK so you don’t have to worry about the international shipping issue? I’ve talked with the guys over there a few times and they always seemed very stand-up and helpful to me. Maybe you could work something out. Thanks Admin but Everyonedoesit were adamant that it was a manufacturer issue and just didnt want to know. I wont be recommending them to anyone. but after a few more emails direct to Dr Dabber kindly posted a replacement battery without having the original returned. Now very happy camper and its working great. Damn, that’s unfortunate they weren’t willing to help you. Glad you got it worked out with Dr. Dabber though.